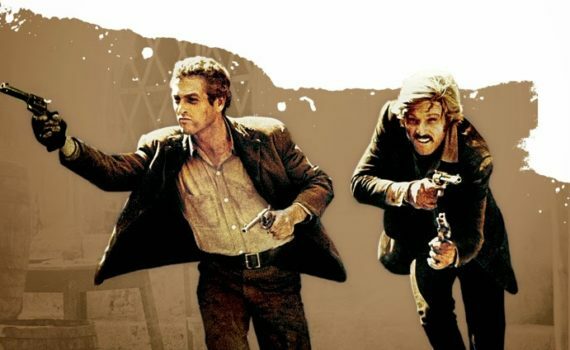 One of the best Westerns ever crafted, Butch Cassidy and the Sundance Kid is also a perfect depiction of the era in which it was made, the switch between the 60s and the 70s that ushered in an extremely unique time in art, music, film, and expression. It’s a cowboy movie and a 70s flick wrapped in one, not a Western using old, warbly guitar music and archaic phrasing, but a breath of fresh air that still holds true to the style that Americans were born to love. I’m not sure a film has ever straddled two styles so perfectly, without making any missteps or leaning too far in one direction. I guess that’s what makes it a masterpiece, and a standout among classics. Butch Cassidy leads an outlaw gang whose specialty is robbing banks and holding up trains, although they’re not especially good at it nor do any of them hold onto their money for long. His right hand man is the Sundance Kid, a gun fighter and gambler who can out draw and out play any man who dares give him a challenge. The two are as close to friends as criminals can be, and when a special posse of lawmen arrive on the scene of their latest job in order to catch them once and for all, dead or alive, the duo high tail it out of there together, unsure of where to hide. With enough money to travel and the sweet Etta at their side, the now-trio head to New York City, and then to Bolivia, a land that Butch believes will be the answer to all their problems. But once an outlaw always an outlaw, and problems have a way of finding you no matter where you hide. The thing that tickles me the most about this movie is the music. It’s so 70s, so perfect, B.J. Thomas, Burt Bacharach, and Hal David joining together to create original songs and a wonderful soundtrack that’s as timeless as the film itself. The songs are just so wonderful, and it could have gone so disastrously wrong, trying to make a Western fit the time the movie was made, instead of the other way around, but it didn’t, it all works seamlessly. The story is great, the friendship is real, Etta adds an important piece, and the comedic timing is the key to the whole thing, working in tandem with the action flawlessly. Newman is absolutely amazing as Butch, playing the part with a humanity that goes beyond the genre and enters into dramatic legend. Redford is less astounding perhaps, but god is he handsome, and he always brings that special something that has enthralled us all for years. There aren’t many iconic features more outstanding that Butch Cassidy and the Sundance Kid, a Western and a drama that somehow showcases too distinct time periods at once, doing them both incredible service.